Anne Boleyn: A King’s Obsession is Alison Weir’s second book in her series of novels about Henry VIII’s Queens and is due to be published on 18 May 2017. 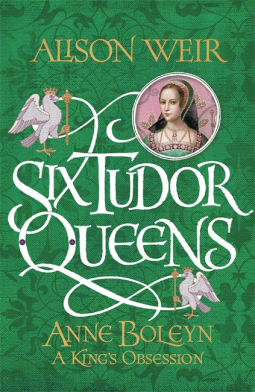 Just like her first book on Katherine of Aragon this is fictional biography at its most straight forward, written in an uncomplicated style. It is a long and detailed story told from Anne Boleyn’s point of view following her life from when she was eleven up to her execution in 1536. Mainly I think because I didn’t know much about it before I really enjoyed the first part of the book detailing Anne’s time at the court of the Archduchess Margaret, Regent of the Netherlands, then at the French court where she served Mary Tudor (Henry VIII’s sister) and then she was transferred to the household of Queen Claude, the wife of FranÃ§ois I. Anne became proficient in French, and accomplished in the art of pleasing, and witty, flirtatious conversation. She also learnt from the Archduchess how a woman could rule, and about the ‘New Learning’, that is the texts of ancient Greece and Rome that had been recently discovered. She learnt from Erasmus about the corruption within the Church and she had access to the Archduchess’ library, where she found books written by Christine de Pizan, who had enlightened views on women’s education. The Archduchess encouraged her to show that women were just as capable as men, so that men would admire women for their courage, character and intellect and not just their beauty. I’m much more familiar with the rest of her life story. As Alison Weir acknowledges in her author’s note in some ways Anne Boleyn is unknowable, we do not have ‘a wealth of her letters’ to get an insight into her inner thoughts and much of the material we do have comes from a hostile source, the Imperial ambassador, Eustache Chapuys. In writing this novel she has tried to reconcile conflicting views of her and I think she has succeeded, portraying her as a flawed and human character. Anne was ambitious and in her early years she had the example of the Archduchess Margaret who introduced her to ideas questioning the traditional ideas about women. Alison Weir has kept closely to the historical record, although taking ‘occasional minor liberties’ and ‘modernising the language in places to make the context clearer. Some quotes have been taken out of context or put in the mouths of others’. And the scenes between Anne and Leonardo da Vinci are imaginary (much to my disappointment). Perhaps it is because she kept closely to the records that the period when Henry was pursuing Anne is described at great length, whilst attempting to end his marriage to Katherine. I found it increasingly tedious to keep reading about how Anne left the court and went to Hever Castle, her parents’ home, then returned to court and then went back to her parents, etc, etc. Overall, I enjoyed this book, but it is too long and in places very pedestrian and flat. At times it is a bit like reading chick-lit, for example as Mary Boleyn describes how Henry raped her and later as Henry complains to Anne that he has not ‘bedded with a woman in years’, looking at her with ‘anguish and longing in his eyes.’ He comes across as a weak character, truly obsessed with Anne but his passion soon cooled after their marriage when she failed to produce a male heir. And Anne is portrayed as a complex, intelligent woman but obsessed with her ambition for the power that came with being queen. My thanks to the publishers via NetGalley for a review copy. I’m sorry to hear you had a mixed experience with this book. I have a copy of this on my TBR too and I am pleased to hear I can look forward to reading more about Anne’s earlier life. Sorry to hear this one wasn’t a tighter, better-edited read for you, Margaret. Still, it is interesting that Weir looks at Anne’s early life; I don’t know as much about that and it sounds fascinating. I’m reading this now and haven’t quite finished, but my feelings about it will be very similar to yours. I enjoyed reading about Anne’s early life, but the middle section was a bit too long and repetitive.